-- Select a Size/Color -- Orange - Out of Stock! 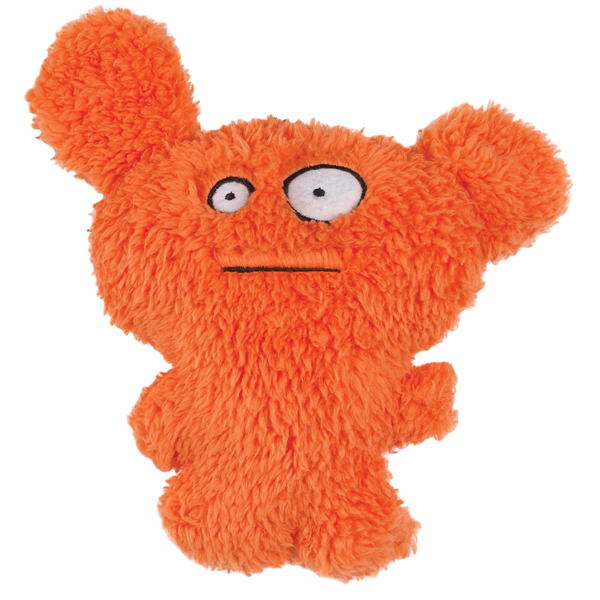 Your pup will love playing with this cute and fuzzy Grriggles Furzies Dog Toy in Orange! Your pup will be instantly drawn to the cute and mischievous look of these soft plush dog toys. This Orange Grriggles® Furzies toy has silly embroidered features that won't pop off or be chewed off. The varying diameters and appendages make this plush dog toy easy to grasp by dogs of all sizes. Squeaker inside. Your dog won't be able to resist the ultra soft plush fabric of this cute little monster toy. It's great for cuddling, light mouthing, for fetching, and more. Squeaker inside. The orange color of this stuffed dog toy makes it a great choice for Thanksgiving and Halloween. It is sure to be your pup's favorite any time of year. Look for the other colors of the Grriggles Furzies. Collect them all! Grriggles Furzies Dog Toy - Orange Customer Photos - Send us your photo! Our little Zuzu absolutely loves all her Griggles!! She chooses them over all her other toys. They are small enough for her to run around the house with. She loves to squish them in her mouth and sleep with them as you can see. Posted On 07/05/17 by Marilyn Jacques from Boynton Beach, FL Yes, Marilyn Jacques recommends this product! My dog loved it's size and the squeaker was nice and loud. Posted On 05/03/17 by Alexandra K from Lincoln, CA Yes, Alexandra K recommends this product! Posted On 01/20/17 by Lauren from Ewing, NJ Yes, Lauren recommends this product! Good size for my BC's, decent quality, good price. I'll be happy if it lasts a month. Posted On 06/25/16 by Deni S from NY, NY Yes, Deni S recommends this product! Our little Zuzu adores these Griggles. She can run around the house with them in her mouth and they make great little pillows to sleep with. We have one in every color. We wouldn't dare travel without them! Posted On 04/21/16 by Sandee L from Bullhead City, AZ Yes, Sandee L recommends this product! Paolo wil flip when he opens up this toy tomorrow for his bday! Posted On 01/28/15 by Kathleen R from Floral Park, NY Yes, Kathleen R recommends this product! Well priced and made. Just not if you have a dog who loves to be rough on chew toys. We gave this as a gift for a puppy who loved it. My dog LOVES this little toy. He hides it so my other dog can't play with it. It's durable and light weight for the smaller dogs. Posted On 11/07/13 by Roberta C from Myrtle beach, SC Yes, Roberta C recommends this product! Love the graduation cap we bought for my daughter's service dog! Well made and adorable. Great Ear straps. Will post a photo after graduation in July! Thank you!